The Nashville Predators hit the ice in front of a roaring sell-out crowd of 17,113 Saturday night to open their 2012-2013 season. Lack of a preseason lead to Nashville’s loss against the Columbus Blue Jackets, according to head coach Barry Trotz. After adding a few new faces, including players such as defenseman Scott Hannan, a lack of skill was definitely not a reason Nashville fell 3-2 to Columbus. All players seemed to read one another well and set ups for plays came effortlessly. It just seemed as if luck was in the Blue Jackets’ favor. Predators’ Martin Erat started the game off quickly with a wrist shot past goaltender Sergei Bobrovsky 39 seconds in, putting them up 1-0. After a slashing penalty was called on Erat, Columbus was able to score their first goal on the power play with a deflection off Fedor Tyutin’s stick. With the game tied at 1-1, the Predators regrouped and got a bit of luck with a roughing penalty being called on Columbus’ Brandon Dubinky. Predators’ defenseman Ryan Ellis was able to slip one into Columbus’ net, putting his team back in front, 2-1. Sloppy play lead to a frustrating second period. Predators’ captain Shea Weber defended fellow teammate Craig Smith, who received a late and high hit from Columbus’ Jared Boll, who is known for being somewhat of a goon. This lead to a drop of the gloves. Columbus received a better pay off, having Shea Weber off the ice for five minutes. NASHVILLE, TN – JANUARY 19: Shea Weber #6 of the Nashville Predators celebrates the first goal of the season during action against the Columbus Blue Jackets at Bridgestone Arena on January 19, 2013 in Nashville, Tennessee. During Weber’s time in the box, rookie Artem Anisimov tied the gave for Columbus at 12:05 of the second after backhanding the puck over Pekka Rinne’s glove. The Blue Jackets controlled the remainder of the second period. The game remained tied throughout regulation and five minutes of overtime. This meant there would be a shootout. There were no goals in the first round of the shootout, but Artem Anisimov scored for Columbus with a forehand, backhand goal over Rinne’s shoulder. The Predators placed David Legwand up to shoot and he kept them alive with another forehand, backhand shot over Sergei Bobrovsky’s left leg pad. After four more nerve wracking rounds, Columbus’ Derek Brassard got Rinne down and scored over him once more. Nashville’s Craig Smith was forced to score, but his shot went off the post, leading the Blue Jackets to victory. 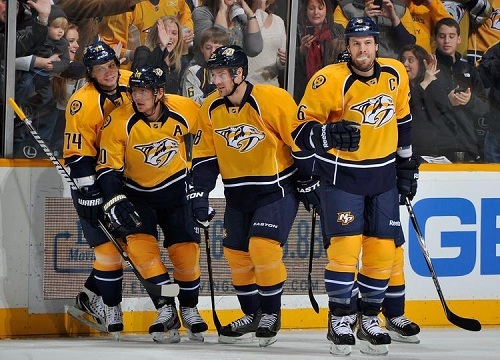 It was saddening for Predators’ fans to watch, but the game certainly did not disappoint. Columbus’ 3-2 win was only their second in the past 20 times they’ve met with the Nashville Predators.